Is it possible to create review apps if my code is hosted at a different place? Review apps are a powerful collaboration tool to discuss about a new features between members of your organization. We implemented this feature as part of our GitHub integration. Let say that you have worked some hours on an awesome new feature. It’s time to show the world your work and to open a new Pull Request (PR) on GitHub (even if it’s not fully done). With Review Apps enabled on Scalingo, we will create a new application (a Review App) with the code of the new feature. You can now share the result of your work, to get it validated, with all people involved, even if they are not in the tech field. Maybe they will tell you to change something like adding tests or to change a button color. You have to push your modification on the branch involved in the PR to update the Review App. If you’ve enabled Review Apps, a new application will be created every time a new Pull Request is opened in your linked GitHub repository. This new application is a child application. This child app will have a copy of add-ons, collaborators and environment variables from the parent application. Having a strict copy of the parent application is sometimes not wishable. You might not want to copy production credentials, or it is sometimes required to start a custom task after the initialization of the app, that’s where the scalingo JSON manifest becomes useful. Here, the value of the environment variable CANONICAL_HOST_URL will contain the URL to reach the newly deployed app. The scalingo.json configuration always takes precedence on parent app configuration. When a review app is created, you might want to execute a custom action like seeding its database. This can be done using the first-deploy scripts in the manifest scalingo.json. If such a property is defined, the given command will be executed as a postdeploy hook after the first deployment. 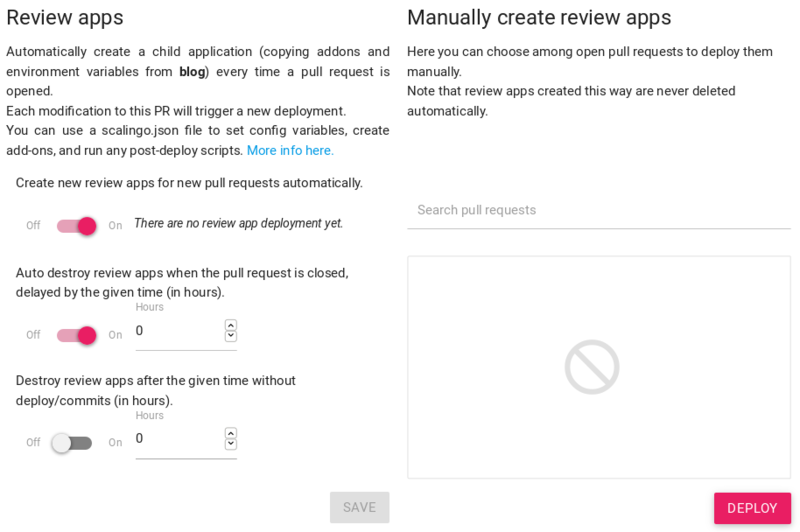 This script replaces the postdeploy hook for the first deployment of a review app. If a postdeploy is defined in your scalingo.json or Procfile, it won’t be executed. "first-deploy": "bundle exec rake db:deploy db:seed"
To run a custom command after each deployment of a review app, you need to define a postdeploy hook for your application. However defining a postdeploy hook would also impact the parent application. And use the environment variable in your postdeploy task to check if it is executed in the scope of a review app or not.